Tag Archives: Christmas Food Parcels 1915. 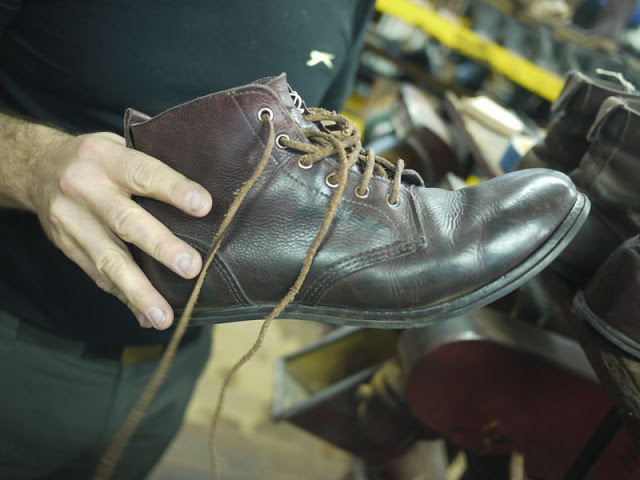 14TH.DEC.1915: PTE BERTIE TO BOOTMAKERS. 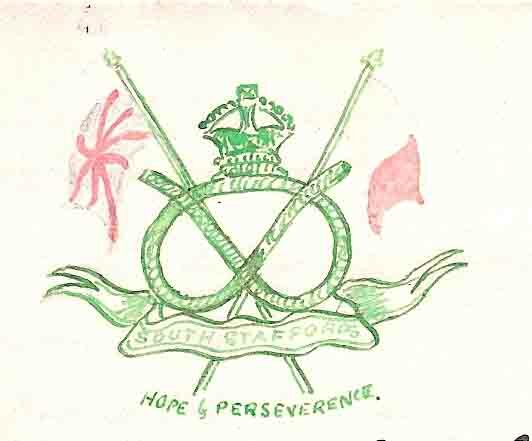 QMS PAL VERNON TO FIELD AMBULANCE. RUE DES VACHES BILLETS, north of BETHUNE. 11th -14th Dec. Platoon & Company Training. Pte BERTIE HIBBETT: LETTER to Marie Neal HIBBETT, 95 Foden Rd. Walsall. I wrote the date this morning & was about to continue when I thought I should in all probability receive a letter from you tonight. I went to the post myself this afternoon on my way back from the bootmakers (1). 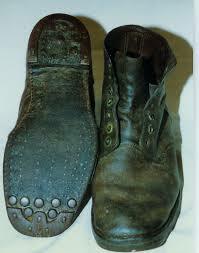 WW1 British Boots B 5. Yes, poor Sydney, you will get my letter of Sunday (2) saying I had his long letter telling me how he got to dear old England. Sydney told me I need not send it Home but I am, as Mum wants me to. I daresay I shall get your parcels tomorrow night (Wed). I also got another parcel for Vernon, which makes the fourth since he left us on Saturday 11th for the Field Ambulance (3). Poor old Verny, how very unfortunate he has been for parcels. 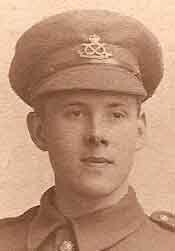 Last night (Monday) he had his Xmas parcels from Home oh dear – & I was away when they came to our billet & when I came back the Platoon Serg. had opened them & was about to distribute them among the Platoon. The contents would not keep until Vernon came back as they were, so I put a sample of everything in one of the tins & am keeping them in high hopes that Vernon will return very soon & enjoy some of the Xmas fare. There was his Christmas cake above all too! I wrote a letter to Mrs Evans & from the beginning to nearly the end it was a very unpleasant undertaking. I said nearly because I had to FINIS happily to wish Vernon’s people a Merry Xmas. I hope you have enclosed some candles; excuse me saying so, this candle is nearly ‘na pou’ finis, so I shall have to close soon (4). This morning I took the opportunity of acknowledging a handsome Christmas gift from Miss K. Brookes* , a Cigarette Case. I suppose she thought I shall receive enough eatables to satisfy my appetite, well quite right too. I heard from Hackett* (5) . . . (censored but ‘Capt. Lister’s orderly’ can be discerned) . . . that no person can obtain a Commission without having been an N.C.O. for two months. I shall put my case forward tomorrow or in a day or two. Forgive me, dear Mum, but I shall relish the mince pies – if there are any coming & I am wondering if Champion has made an attempt at a cake. Lights out – I mean the candle – ’tis not 6 yet. Let’s see. I shall want about four dozen Xmas cards from Boots Park St – I shall leave the billet & go my shopping down Walsall Town. I was puzzled on reading what Vernon’s brother told Basil about him not hearing for 3 weeks. I felt it my duty as a friend to be faithful to Vernon & take care of his parcels, but I do not at all like it. He said he thought he would be back in three days. I will wait either till tomorrow night (Wed) or keep patient till we move. I might try to carry some of his parcel from Home in my valise. I should like you to converse with his people about it. I said my next letter would be to Basil & Ida, but dear Mummy has had to have first attention lately. I shall write my Christmas letter to you all either next Sunday or Monday the 20th, or I might write it when I get the parcels. Dost thee remember my Christmas letter last year at Saffron Walden? Drawing to the end of November we shook hands with our old Colonel, who came to give us a surprise visit (7): when at Saffron Walden he hoped we would spend next – i.e. this Xmas at Home, which I am hoping to see about. Best love to all hoping & trusting you will all keep in the best of health & good spirits to enjoy a Happy & real Christmas. Pte Bertie Hibbett’s feet & those of his pal Vernon Evans suffer the consequences of the waterlogged march from Neuve Chapelle trenches to Rue des Vaches Billets, 5th Dec.1915. Bertie appears to be about to visit a local French bootmaker to repair or replace his boots and Vernon has gone to The Field Ambulance to be passed up the Casualty Evacuation Chain see (3) below. 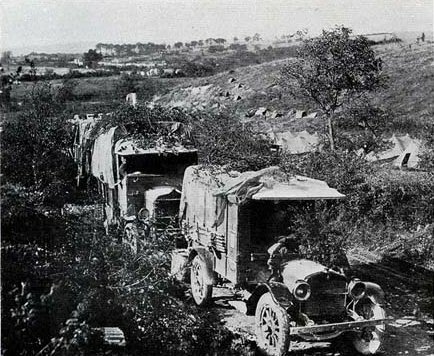 (3) The Field Ambulance (not a transport vehicle as today but) a RAMC organised Casualty Evacuation Chain attached to each Division: consisting of Bearer Relay Posts immediately behind Regimental Aid Posts in the Front Line, further back the Brigade’s Advanced Dressing Stations (ADS) & further back still the Divisions Main Dressing Station (MDS). There were also Walking Wounded Collection Stations, Rest Areas and Sick Rooms. (Regimental Aid Posts could be in a dugout, communication trench, ruined house or deep shell hole). See The RAMC in the Great War. https://www.ramc-ww1> Also The Long Long Trail. <https://www.1914-1918.net/fieldambulances&gt;. Each Field Ambulance had 10 Officers & 224 men (no weapons or ammunition). 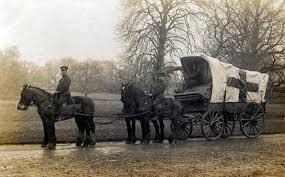 Each Division had 23 wagons & 3 water carts and 10 ambulance wagons for transport/ mostly pulled by horses but some motorised ambulances. (4) ‘na pou’/slang for ‘finished’, ‘no good’. (5) William? Hackett’s* application for Commission was successful, he eventually became a Captain. (Queen Mary’s Grammar School, Walsall, 1900-1905). Interestingly his training as Captain Lister’s* Orderly involved attendance at Army Servant School. (He died in 1918 in Scotland, reason as yet unknown ). (6) N.C.O: A private must have had some experience as a Non-Commissioned officer (Lance Corporal/Corporal/Serjeant) before acceptance for Officer training & Commission. (7) Colonel Crawley*. See A Little Book of Words & Doings. Letter: 5th Dec. 1915. 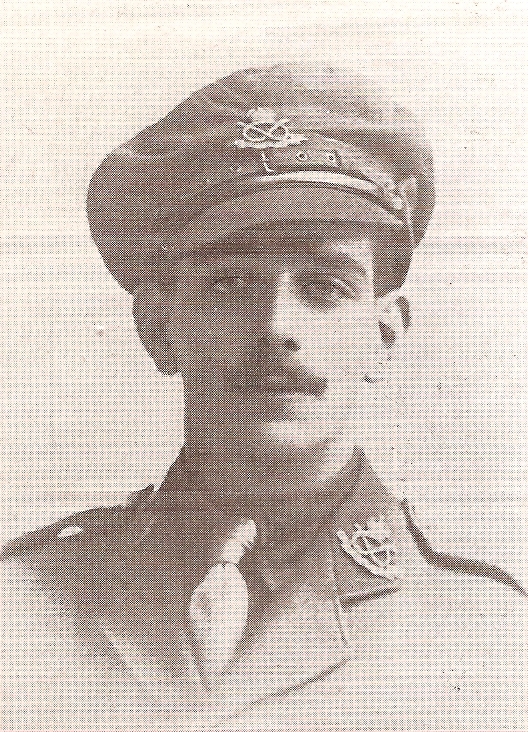 NEXT POSTS: 19th Dec. 1915. Letters to all Four Hibbetts: Basil. 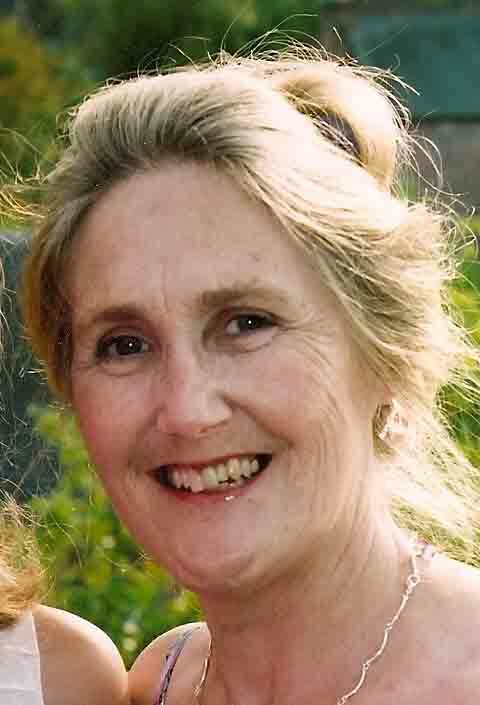 Ida, Mother & Father, to arrive for Christmas. ADS & MDS.Army Bootmakers.Army Servant School.British Army Boot B5.Casualty Evacuation Chain.Christmas Food Parcels 1915.Commission Applications 1915.Field Ambulance.R.A.M.C.Rue Des Vaches north of Bethune 1915.WW1 Boots & Last.